“Welcome to the beautiful Sinclair family. The Sinclairs are athletic, tall, and handsome. We are old-money democrats. Our smiles are wide, our chins are square and out tennis serves are aggressive. It doesn’t matter if divorce shreds the muscles of our hearts so that they will hardly beat without a struggle. It doesn’t matter if trust-fund money is running out; if credit card bills go unpaid on the kitchen counter. It doesn’t matter if there’s a cluster of pill bottles on the bedside table. Summer fifteen is a blur for Cadence, it was the summer of love, of excitement and of fun. But it was also the summer of an accident which has left her with gaps in her memory. Her summers were always spent on the family’s island and Cadence would spend all her time with cousins Jonny and Mirren, and Gat who may as well have been part of the family too. They were the oldest of the Sinclair grandchildren, and they were the Lairs. They are beautiful and privileged, they are cracked and broken, and this summer, summer seventeen, Cadence needs to rebuild her memories of summer fifteen. this is a tale of love and romance but its also a tale of tragedy. There are lies and there are truths, but who knows what is what? This book is about privilege, its about money and family, and beautiful people getting exactly what they want from life, regardless of the consequences. Its about love and how love does crazy things to people if they let it, and its about teenagers watching the adults in their family struggle over something they have no real control over. For the most part, its a good book; well written with an odd narrative style that works really well when you consider that the narrator has lost a lot of her memories from the time she is referring to the most, and the pace is spot on. However I struggle with even the most well written book if I dislike the characters and that was my main problem with We Were Liars. The characters in this book are up themselves – at least the adults from the Sinclair family are. The mothers in the book, Penny, Bess and Carrie, were raised with money, never wanted anything and never did anything in return for the things they got. They were spoilt little rich girls who grew up to become spoilt rich women marrying for the approval of their own father and having marriages fall apart, only to carry on living off the fund their father set up for them. This made them evil and manipulative and after all they could swindle from their father, involving their kids in schemes to ensure they got this piece of art or that house and that set of dinner plates. It was pathetic and in turn they created children who only really thought of themselves and didn’t have much of a personality in my opinion. In all honesty the only character I really liked was Gat and even then I didn’t understand why he returned every summer. I wouldn’t have been able to live around people like the Sinclairs if I didn’t have to! I feel bad for saying it but when I started to learn more about the family and their ways it just bugged me even more and I only carried on until the end because I had heard amazing things about it. Don’t get me wrong. The end was pretty awesome and I was very impressed with what the author did. However everything came about because of the family and their ways and when you dislike the family its easy to disassociate yourself from whats going on. I hate to say it but this book was just average for me. If I liked the characters then it probably would have blown my mind but the story is what it is because of the characters and thats where my problem lay. I wish I loved it as much as everyone else and I know I am going to get a series of ‘OMGOSH I can’t believe you didn’t like it, are you crazy!’ comments from other readers of the book, but at the end of the day everyone is different and this just wasn’t for me. 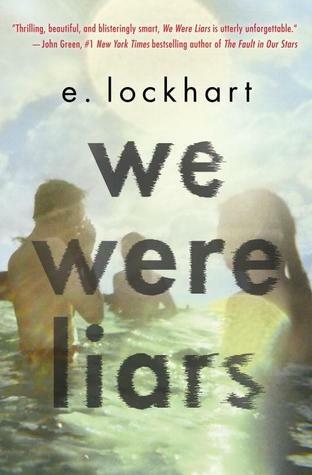 We Were Liars was published on May 13th by Hot Key Books. My copy was sent from the publisher in exchange for an honest review. Like you, I often don’t like a book if I don’t like the characters, and the characters in this book are awful. But, I loved the style and form of this book. My reading was that the novel handles privilege in the way that privilege both tackles and protects itself. Multiply tragic.